Microwave ovens can do a lot of things -- pop popcorn, heat frozen burritos and warm up leftovers. But they can also burn your house down, for reasons that remain somewhat obscure. Like self-destructing Martha Stewart tables, flaming microwaves are a phenomenon we've been hearing about for years and, like Martha's table, no one has addressed the issue very vigorously. 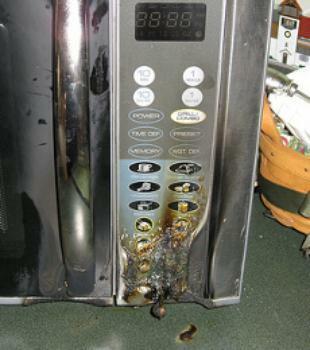 One of the latest complaints comes from Channelle, who reports that her Samsung microwave caught fire when no one was home, causing major damage to her kitchen. "I had contacted Samsung about five weeks prior letting them know that the microwave was starting on its own whenever you would open the door to put something inside of it," Channelle said. "However their customer service agent advised that since I had not purchased an extended warranty, there was nothing they could do unless I purchased their almost $400,extended warranty." Two days before the fire, Channelle said the microwave started,coming on by itself even when no one was nearby. "It would also spark a little as if there was foil or something inside of it," she said. The problem isn't limited to Samsungs. In fact, GE Spacemaker ovens have generated so many complaints, they have their own ConsumerAffairs page. "Woke up in the middle of the night to find my microwave running by itself. Turned it off and after a few minutes, it set itself for 1 minute and started running again. Unplugged the unit so not to have a fire," said Gary of Parkton, Md. "Our GE Profile microwave caught fire on Christmas Eve!" said Jill of North Babylon, N.Y. "Fumes from the transformer (magnetron) fire are horrible! It did not shut off. The fire department had to take it out as it continued to smoke! It’s defective; it needs to be recalled! It’s faulty, defective, and dangerous." Emerson microwaves have also generated their share of complaints. The most obvious advice to homeowners in a similar situation is to unplug a microwave oven that starts acting weird and to replace it as soon as possible. Of course, for consumers whose microwaves are built into the kitchen cabinetry, this is not as simple as it sounds. The U.S. Consumer Product Safety Commission (CPSC) has recalled a few microwave ovens, including some Samsung over-the-range models,but whether Channelle's was among those recalled isn't known. As our Mark Huffman reported in an earlier story, manufacturers often claim that dirt and debris in consumers' ovens can cause arcing, which in turn can start a fire. But that doesn't explain the fires when the devices are unattended and not in use. We asked several appliance service technicians about the problem but none would speak publicly about it, although all advised keeping microwaves unplugged when not in use, especially older models. As with all electronic gear, it's advisable to use a surge protector to prevent the device from being damaged by electrical disturbances.